I don’t understand why records are hardly considered as art objects. I mean, apart from a small group of record collectors, there is little or no interest in LP’s as artefacts. Considering the amazing beauty of many record sleeves, that can be bought for the price of a donut, it is a miracle why there are so little LP’s hanging on the walls in homes. But maybe it is better not to say this, because records should be on record players, and not on walls, of course. The LP that the Dutch band Au Joli Bois recorded in 1977 is a good example. It has been hanging on the wall of our living room for years. I bought it because I loved the painting on the cover, made by Goddefroy. But the music is also interesting. 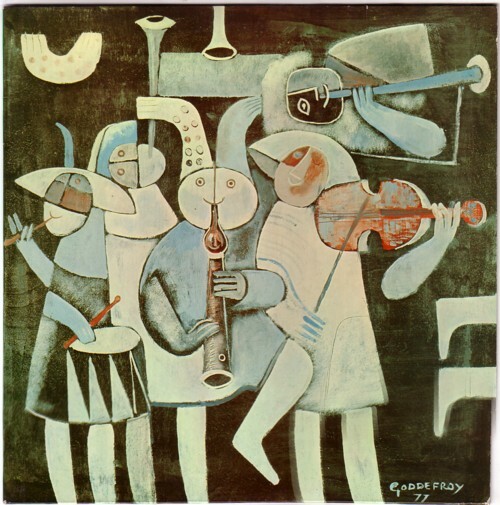 The LP contains a collection of mainly instrumental songs from the days of Pieter Brueghel and Jeroen Bosch. It is music that was played for ordinary people, in bars and on festivals. 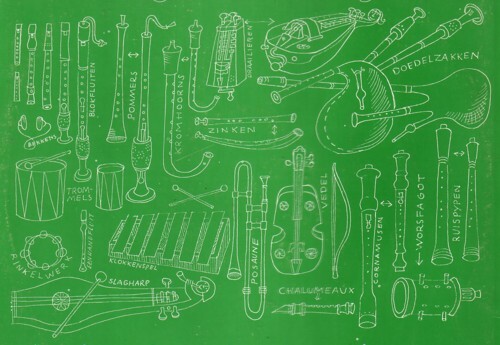 Au Joli Bois uses instruments that were used in those days. Unlike several other of such projects that I heard, this LP really gives me an idea how this music was for the people who listened to it centuries ago. It is pop music! Here is an example, a tune called De Morendans. The sound quality is a bit pour, but that is because the sun has turned the LP into a more 3-dimensional object than it originally was.